This entry was posted in Uncategorized and tagged September 11. Bookmark the permalink. 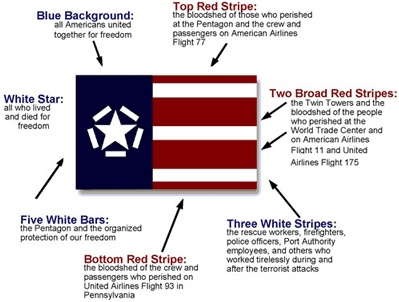 Excellent post remembering 9/11. Who designed this “card” and is it available. I enjoy reading your blog. Keep up the good work. Hello Chris — please tell me more about this significant flag. On a less significant note, I added Sazon Goya to a lackluster meat sauce the other night — the comments!! Usually I spend so much time with brown sugar, vinegar, worchestershire trying to spice thngs up — but that little packet did the trick! Hello Ms. Heston, amazing little packet, no? I dunno, it looks weirdly Cuban.